If the boat fits... wear it. Imagine walking into a specialist outdoor store looking for walking boots and finding there are only two sizes. Then imagine asking why there are only size 9 and 13 and being told that these sizes fit "most people"(read large males). Finally imagine the helpful store person explaining to your smaller companion with size 5 feet that the size 9 is is perfect for her as long as she is willing to wear enough socks. 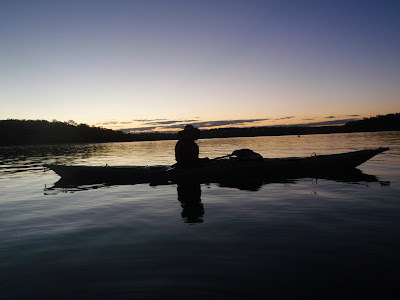 I think kayaks and shoes have a lot in common and no amount of closed cell foam and wishful thinking will make a small paddler feel connected in a medium to large boat any more than a dozen pairs of socks will make big shoes fit smaller feet. 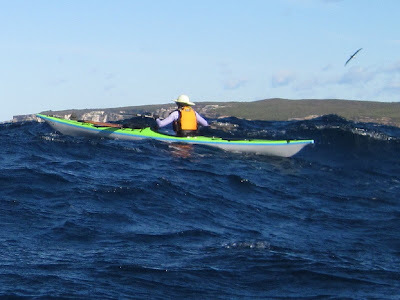 A few years ago there really was no choice in Australia for smaller paddlers but to follow the "wear more socks" principle. With very few imports and a small market it made economic sense to build kayaks that suited the male dominated sport: i.e. expedition ready boats that performed adequately for medium to large men when empty. Unfortunately because everyone smaller than this would fit into these larger craft, it was assumed the boats fitted them. It is possible to have too much stability. It is tiring to edge, maneuver and brace an oversize boat, particularly if there is so much initial stability that it prevents you from heeling the kayak easily and precisely. A wide boat that responds well for a heavier paddler with a high centre of gravity may simply simply feel like a barge to individuals shorter and lighter in the torso. The Hip Test: When the boat is tilted the coaming and deck should not interfere with elbows or ribs. If you want to edge and roll the kayak you need to wear it so that the coaming is approximately aligned with the top of the hips. Longer isn't always faster: Although a longer waterline equals higher potential speed this potential is only realised if you can produce enough power to overcome the drag generated by the extra wetted area. A scaled down boat may be a little shorter but the reduced waterline beam and wetted area will often more than offset reduced waterline length. Weight: All other factors being equal, the lower volume (LV) boat will be lighter than standard or HV equivalents. Lighter boats accelerate faster on the water and are easier to handle off the water. Beam: A reduced beam and height amidships allows shorter legs to engage the deck without straining into a very wide ''frog position". A narrower foredeck also allows a closer catch without overreaching, making it easier to roll as well as paddle. Bulkheads: A scaled down cockpit area and closer spacing of bulkheads reduces the floodable area in the cockpit, and makes the boat easier to manage if it is swamped and easier to empty if it is capsized. made her own plywood kayak: a ''Baidarka" built from plans that had been scaled down to give her a boat that would provide the same proportional fit as the larger composite craft that I had always found easy to paddle. Her boat control skills improved dramatically and she handled the challenging maiden voyage from Sydney to Jervis Bay in challenging conditions with new found confidence. These days there are options in the low volume market. Her regular kayak is an Impex Force 3 and she has her eye on an Avocet LV to add to the fleet in the future. 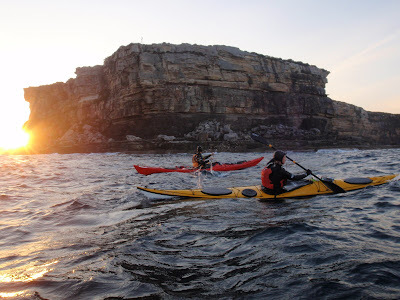 As sea kayakers have become more aware of the connection between boat fit and performance the number of LV models has steadily grown and new LV paddlers seem to be vindicating this move by learning faster and paddling better than ever before. A spin off from the "Low Volume Revolution" has been the number of medium sized paddlers who have found these general purpose LV tourers make excellent play-boats. But, if you usually paddle a standard kayak don't expect any offers for a test paddle from the LV crew. They will be too busy ''getting amongst it" and won't happily sit on the beach watching you have all the fun.